The most obvious reason to travel to the Andaman’s is to let oneself go completely, to recharge the body and collect new ideas. 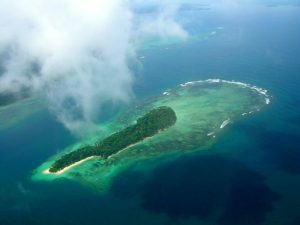 The Andaman Islands, despite lying more than 1,000 km east of the Indian mainland and only about 300 km west of Bangkok, run the same time as Delhi i.e. the Indian Standard Time. On a trip to these islands, one should make sure to bring a lot of good books, some strong sun lotion, a hammock and snorkeling equipment. Port Blair, the only sizable town on the islands, serves as the administrative capital. The center of the town is the lively Aberdeen Bazaar. Constructed entirely of wood, it has been razed to the ground several times in the past. However, every time, reconstruction was completed in no time and now it is as colorful as ever. Port Blair is the only place to do some sightseeing. The major attraction here is the Cellular Jail, slowly being claimed back again by nature, overgrowing with plants and moss. Today, the jail is a memorial to the freedom fighters, who laid down their lives to make the country independent. The library here has some interesting books for those interested in knowing more about the indigenous tribes. The Anthropological Museum displays some tools, dresses and photos. An interesting place is the Marine Museum, which covers the history and geography of the islands and the Fisheries Museum displays the rich marine life of the Andaman Sea. Tour to Andaman and Nicobar Day trips from Port Blair offer various natural and historical excursions. One can either take a boat to Ross Island, the early administrative center of the British, or hike up Mount Harriet. Scuba diving is an option available in Wandoor, 30 km southwest of Port Blair. The easiest accessible islands from the capital are Neil and Havelock. Small boats leave the Phoenix Bay Harbor four times a week to Havelock, usually docking at Neil on the way. One can be escorted by a school of dolphins or spot giant sea tortoise and flying fish. It is worth spending a few days on Neil. Basic accommodation is provided in the small settlement near the jetty. Havelock, lying north of Neil is one of the islands chosen by the government to turn into a luxurious tourist destination. The coral reef here is still intact and is what makes snorkeling a great pleasure. Only the northern part of Havelock is populated. To make it easy to remember locations, they are numbered from one to seven. The boat docks at no 1. The best accommodation is at no 5 and when one plans to take a stroll on a beautiful beach he should head for no 7 then turn left at the junction at no 3. BY AIR – Five weekly flights between Calcutta and Port Blair and four flights between Chennai and Vishakhapattnam connect the islands to the mainland. LOCAL TRANSPORT – The Directorate of Shipping Services maintains regular inter-island foreshore and harbour ferry services to cater to the needs of inter-island commuters. There are local buses, bicycles, motorcycles, auto rickshaws, and taxis available for local transport on the islands.